Apple is gearing up to bring its innovative Business Chat feature out of testing and into production with the release of iOS 11.3, giving individuals a streamlined, new way to communicate with customer service without wasting time sitting on hold and without reporting the contacts of all their friends. A decade ago, Apple revolutionized the mobile telephone by effectively replacing it with a general purpose computer with a full-screen, bitmapped display. 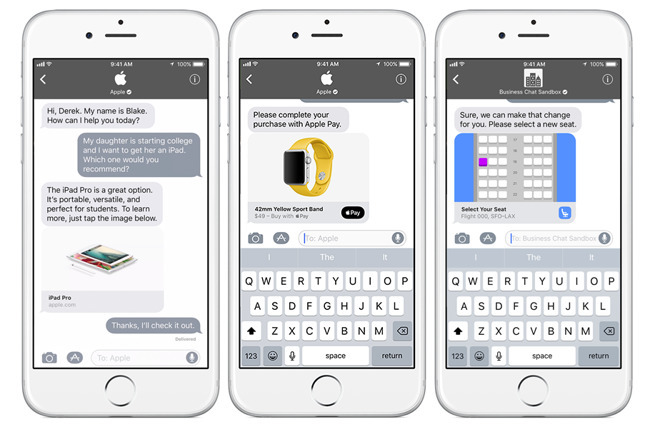 Apple is now working to help businesses to take full advantage of the power of mobile devices by providing a better way to communicate with their customers, using the same chat medium Apple has focused much of its development efforts on improving: Messages. Chat offers attractive advantages over both emails and telephone conversations because its conversational threads don't require actively waiting on hold for a phone response and don't involve the length and weight of emails. 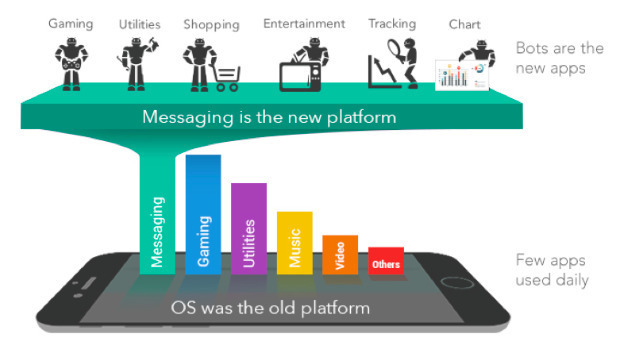 Nuance, one of the Customer Service Platforms supporting Apple Business Chat, noted the over half of the customers it surveyed said they preferred to use some form of messaging to communicate with companies, with 21 percent saying they've communicated with businesses via text and more than 29 percent saying they'd used a form of social media messaging such as Facebook Messenger, WeChat or Line. As Apple mainstreams Messages as a preferred way to communicate with customer service, the numbers for chat support look poised to grow dramatically. At the same time, there is a growing weariness among consumers to surrender large amounts of their unrelated personal data to other businesses, a practice Facebook modeled and popularized with very little media criticism right up until recent scandals broke loose. In the same way that Apple News can provide users with a custom curated news feed without tracking and recording their "likes" and a social graph of who they know and what they talk about, Apple Business Chat will enable individuals to communicate--via Messages--with customer service teams at verified companies for help with product orders, troubleshooting and scheduling appointments--all without demanding that they give up extensive reams of personal data and social links. Finding a company and starting a Business Chat is easy: users simply click on one of the new chat icons suggested by Safari or Spotlight search, associated with a location in Maps or appearing on the web. Individuals can also point their iPhone camera at a special QR code in a store or attached to a product. iOS will recognize the QR code and offer to initiate a chat. The new Business Chat icons or QR codes open a new conversation type in iMessage. A specific chat button or QR code can include a URL payload that can associate the user with a geographic location (such as a local retail store presented in Maps), a specific product configuration they are looking at or have purchased, their language, or a specific team ID (such as order tracking) that identifies what they need help with. Apple Business Chat connects the incoming IM request to the appropriate response team at a company via a Customer Service Platform (CSP) including Genesys, LivePerson, Nuance or Salesforce. The firm's chat agent can then pull up previous conversations with that customer, access the details of the product they want help with, their associated orders or other shipments in progress, and provide authenticated answers, using only the data a customer would expect a company to have access to, rather than the details of all the apps they have installed, who they know, what websites they visit and what words they type. The customer service agent can also do anything iMessage can do, including sending photos or other attachments, as well as receive photos and other attachments from the customer to troubleshoot a problem. Companies will able be able to send the customer links to download a specific App Store title. Apple Business Chat also supports iMessage App extensions, a feature first introduced in iOS 10 as a platform for enabling users in iMessage to collaborate with their friends on a pizza order or to pick a movie and showtimes together. In Apple Business Chat, companies can create iMessage App extensions to similarly expose features of their custom apps to the customers they chat with. Last summer at WWDC, Apple demonstrated an example of an airline seat selector that could be sent to a user to graphically present their options and pick a preference. Apple also created some general purpose "chat pickers" that a customer service agent can use, including a List Picker for offering the customer a graphical set of options to choose from (such as a list of product options), a Time Picker (for scheduling appointment times; the user is even presented with potential scheduling conflicts from their local calendar) and an Apple Pay transaction request (for processing orders or other payments within the chat session). Apple Business Chat takes web-based chat services and integrates them right into a user's Messages app, providing a chat history and sophisticated integration with both the company's custom apps and the user's calendar, camera and other local data, all of which remains under the individual's control. Companies will be able to send response notifications to users who have already initiated Business Chats with them, but the customer will have the power to ignore notifications (and still receive messages), or alternatively delete their conversation entirely and block the company from messaging them again. 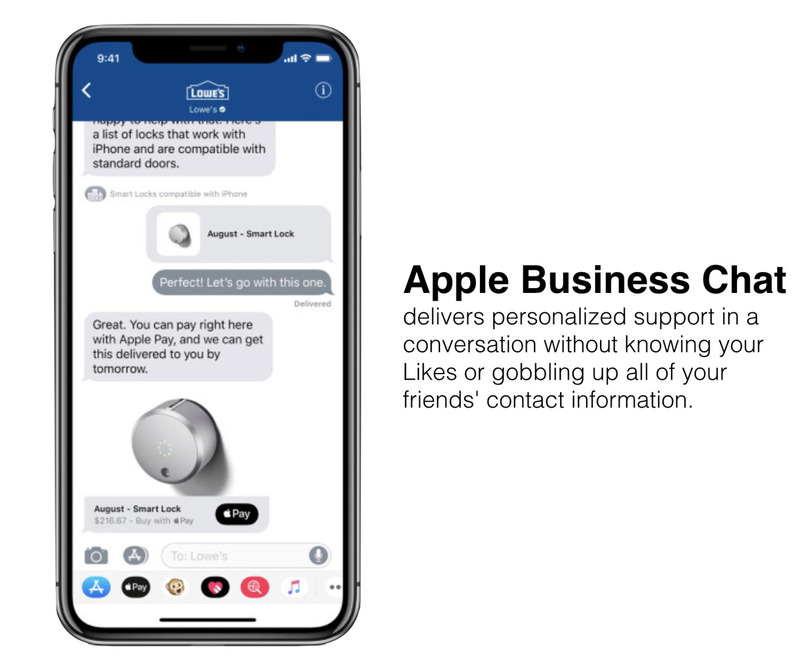 Unlike automated AI support chat systems that only two years ago were predicted to wipe out apps (and Apple along with it), Apple's approach to customer service with Business Chat focuses on personal, customized interaction with a real person. Apple's Business Chat isn't just a theoretical solution to a problem. The company has gained experience in using Twitter and other social networks to interact with its own customers. In 2016, Apple was even awarded a "Gold #Customer" award from Twitter for its use of the public and direct messaging platform to provide customer assistance. Apple itself also provides customer support across a network of its global retail stores, giving it special insight into the needs of other retailers and businesses who want to streamline and enhance their own ability to provide efficient support for users. With its integration across iOS search and Maps, Apple Business Chat offers a platform for companies to offer sophisticated customer support to the most valuable demographic of mobile users, without demanding an unnecessary encroachment upon of their privacy and personal security. In the future, we can expect to see further integration with Siri and CarPlay, enabling users to initiate or respond to Business Chats hands-free. Apple could also press further into social media features without surrendering user privacy by lining up Business Chat partners in music and entertainment venues and other ticketed events, or support for retail orders and sales transactions conducted in-store by the customer using Apple Pay. While other platforms are working to gain adoption of their own chat platforms--often with the intent to see and analyze what users are typing--Apple's historical leadership in and focus on privacy and end-to-end encryption in Messages gives it a strong advantage in trust and security.